I’ve never been a spider webs and dripping blood kind of girl! For Halloween, that is. 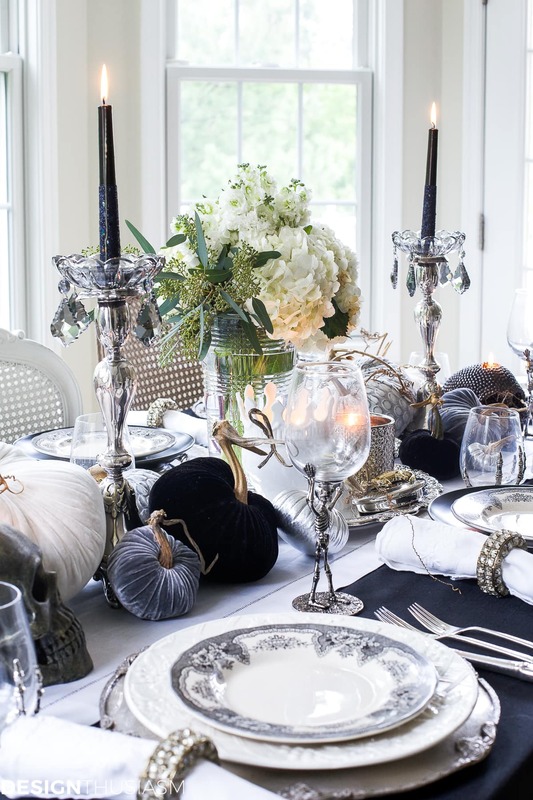 But I do love the challenge of transforming a kitschy holiday into a posh themed celebration. 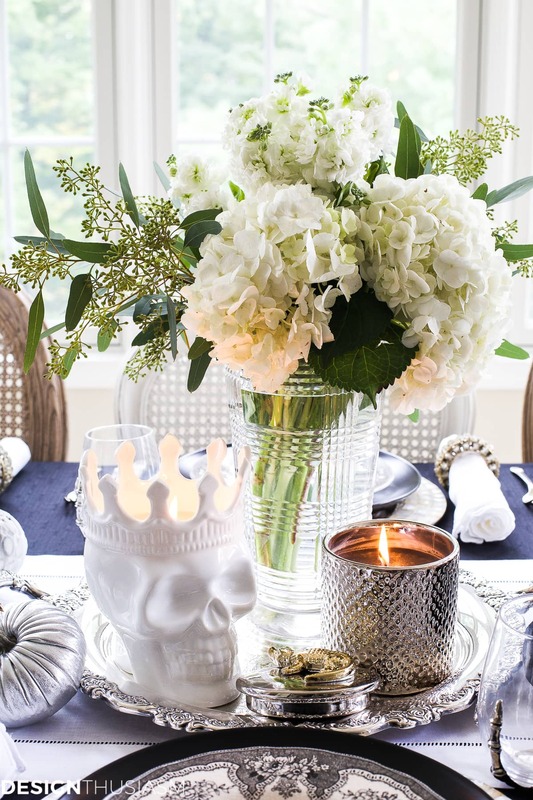 This is exactly what was inspiring me when putting together this elegant Halloween dinner table. 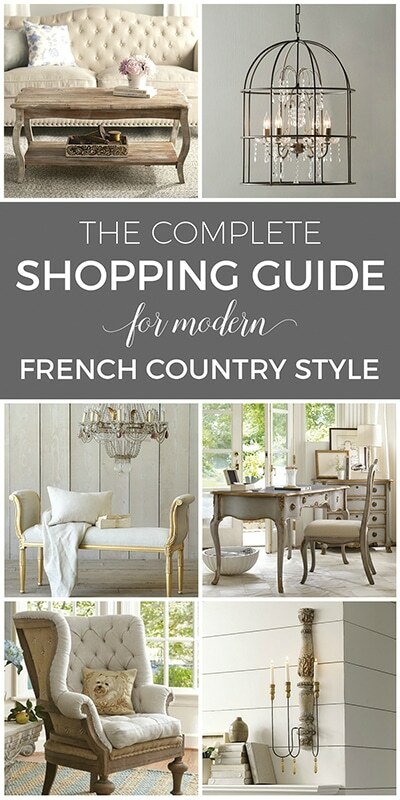 I’m delighted to be joining a wonderful group of bloggers today for the bHome Fall Inspiration Blog Tour, organized by the talented Lidy of the French Garden House. 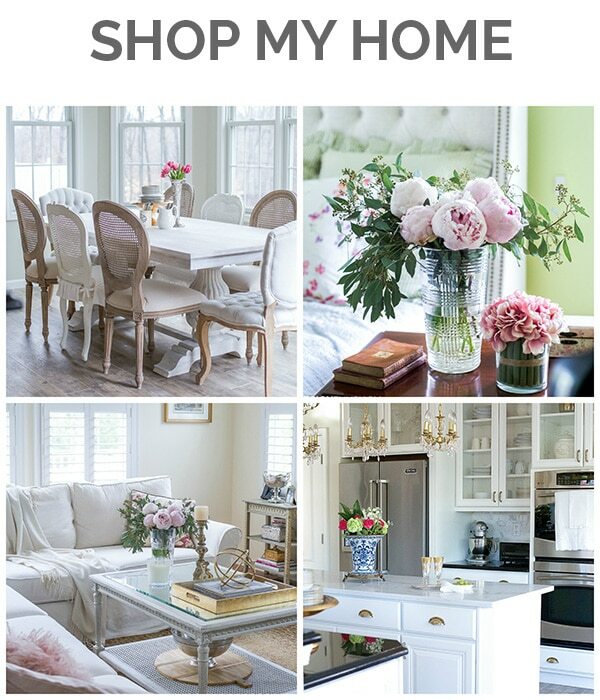 If you’re coming over from Edith & Evelyn Vintage, welcome!! 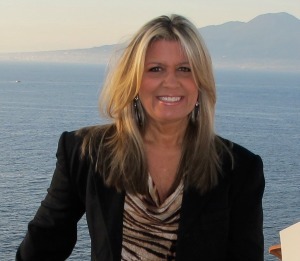 I know you have been charmed by Cindy’s beautiful post and I invite you to relax and continue the tour here. We also have a GIVEAWAY at the bottom of this post, where you can follow on to the next stop on the tour. So how exactly can one strike a balance between Halloween themed imagery and a refined table setting? For starters, I decided to stick with a black and white color palette with pops of crystal and silver. The omission of orange is the first way to ensure your table looks like it was set for adults. The selection of upscale textured details adds another note of sophistication. For my plate stack this meant beginning with a mother-of-pearl charger and layering on a simple black dinner plate and delicately patterned salad plate. The suggestion of black lace in the pattern reads a bit Victorian or Gothic, a more dignified way to signal Halloween without using bats or rats. Where I did get a bit more literal is in the goblets and other stemware. 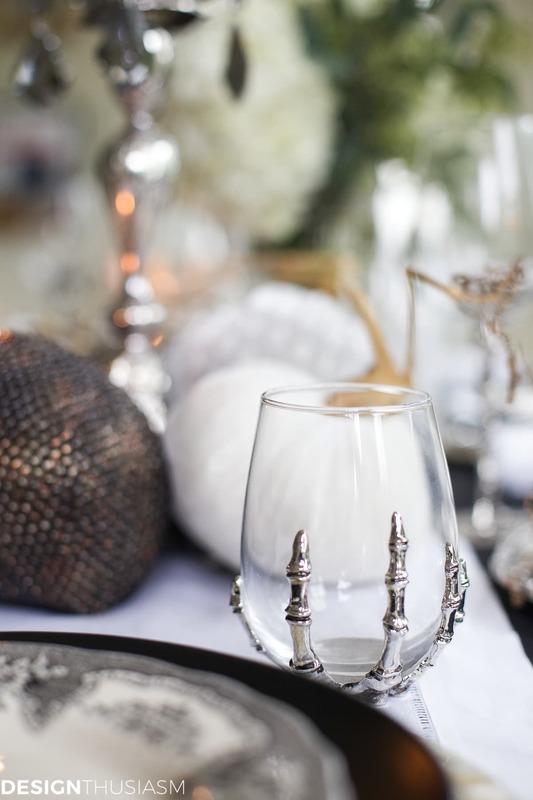 The claw wrapped drinking glass is a fun addition to the table, clearly emblematic of Halloween, but without sacrificing the tablescape’s polish. I never worry if I don’t have a full set of dishes and can always mix and match. I alternated both the chargers and the dinner plates, staying within my color palette, and tied them all together with the salad plates on top. The real stars of the table, however, are the decorative items running down the center, including these lush velvet pumpkins provided by sponsor Plush Pumpkin. (Be sure to check out the Giveaway at the bottom of the post.) I chose black, grey and off white, along with silver and a textured grey print. For height I used vintage silver candlesticks with smoky grey bobeches and black glitter dusted candles. 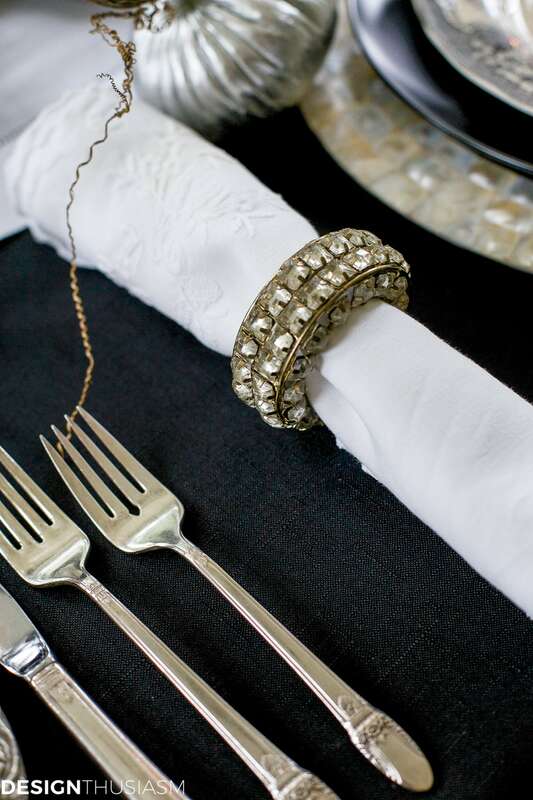 A little more bling was supplied by the crystal bracelet napkin rings, which tastefully corral the vintage embroidered napkins and work well with the stately silver flatware. 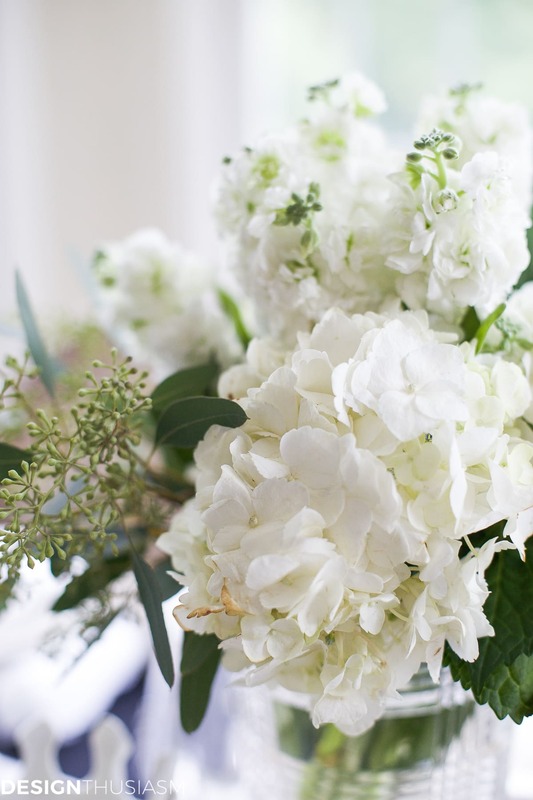 For florals I went completely white, using stock and snow white hydrangeas. Seeded eucalyptus is a favorite standby for greenery, as I love the drapey movement it adds. The other special touch is the use of luxurious candles in the centerpiece, gathered on a round silver tray. The white skull candle has a heavenly scent and was provided by Thompson Ferrier. 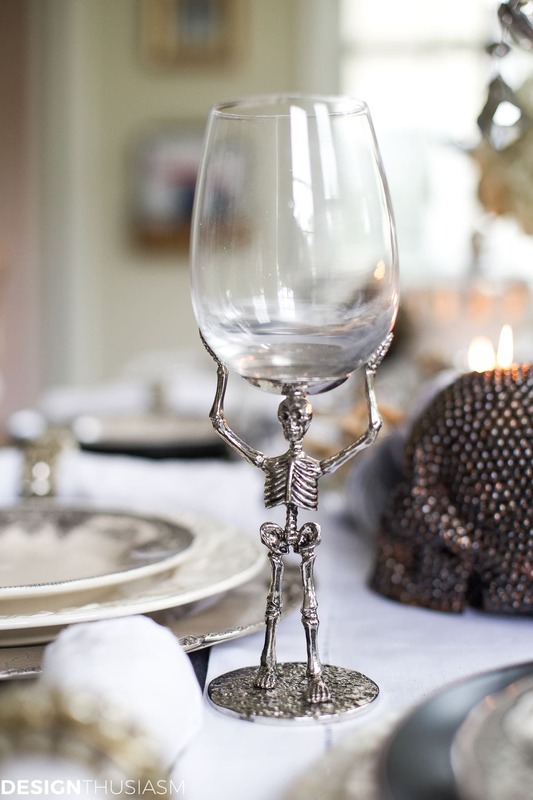 The final homage to Halloween comes via the quirky skeleton goblets. 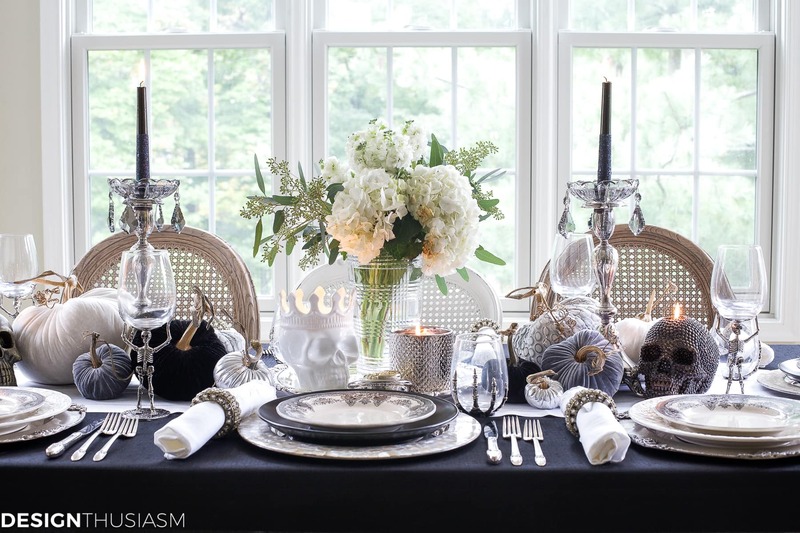 The table setting is pretty enough for any elegant celebration, but the unique imagery utilized makes it perfect for a Halloween dinner! Our bHome Tour sponsor Plush Pumpkin has graciously offered to provide a gorgeous collection of their stunning velvet pumpkins to one winner. The velvet pumpkins are hand made of silk velvet, for a luxurious accent to your home. To enter please visit PLUSH PUMPKIN and/or pin the above image, and let us know in the comments below that you did. Winner will be chosen at random & notified by email on Sept. 22. Good luck!! Next up on the tour is the amazingly talented Bre from Rooms for Rent. I entered the pumpkin giveaway. Thanks. I am new to your blog, and I just love your ideas. You inspire me! Thank you so much, Liz! How nice to know my posts inspire people!! Welcome to the blog and good luck in the giveaway! I must admit that I have never seen such a most elegant Halloween table!!! It is fun and yet so exquisite! I have gotten away from decorating for Halloween so much since my son left the nest, but now you have given me inspiration to set an elegant table for this fun night!!! Happy Fall and Happy Halloween Lory! Thanks so much, Shirley! I actually did a Halloween wine tasting one year, so I do enjoy the challenge… 😉 Happy fall to you too!! Thanks so much, Norma! I actually started doing adult tables for Halloween when my kids were small and the adults would get together while the kids ate their candy… 🙂 Now I just think it’s a fun challenge. Gorgeous, and so elegant. This pushes me to get out of my black and orange Halloween concept. Thank you for sharing the PLUSH PUMPKIN website. Love, love the velvet pumpkins and the adorable acorns. Pinned and shared it so my friends can visit as well. You have been truly blessed with a gift of decorating. 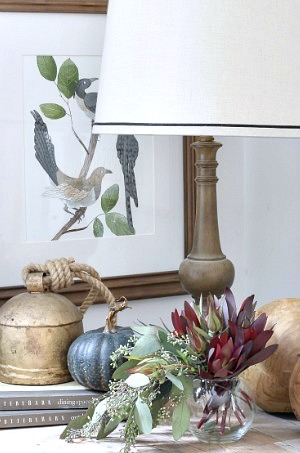 I absolutely love the lush velvet pumpkins I pinned. They add such a beautiful touch to your table. Please keep bringing us these wonderful and elegant ideas. 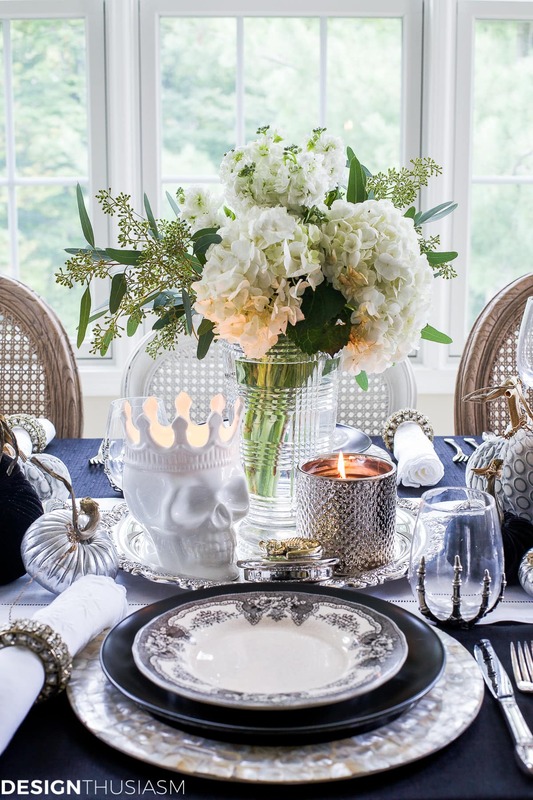 This is a fabulous Halloween table and I am crazy for your skeleton goblets. Also, love the black and white, so elegant. Thanks, Sandra and right back to you!! Oh my gosh Lory. I never in a million years thought you can make Halloween elegant. You nailed it. I think my favorite item was the skeleton holding the goblet. I must get the set. Thank you for this enjoyable piece. Thanks so much, Cindy! I love when people can really appreciate an elegant perspective… 🙂 I find the challenge fun! I too entered for those lovely plush pumpkins. Thank you for that opportunity. You are most welcome, Cindy!! Good luck! This was so creative! And so pretty! I visited the website and love the Seaside set. Thanks, Regina!! I appreciate your words and gold you visited, as well! This is a GREAT tablescape – thank you. And I Pinned the GORGEOUS plush pumpkins to my Fall and Halloween pins! Now to go order some! Thank you so much, Laura, for the kind words and for pinning!! 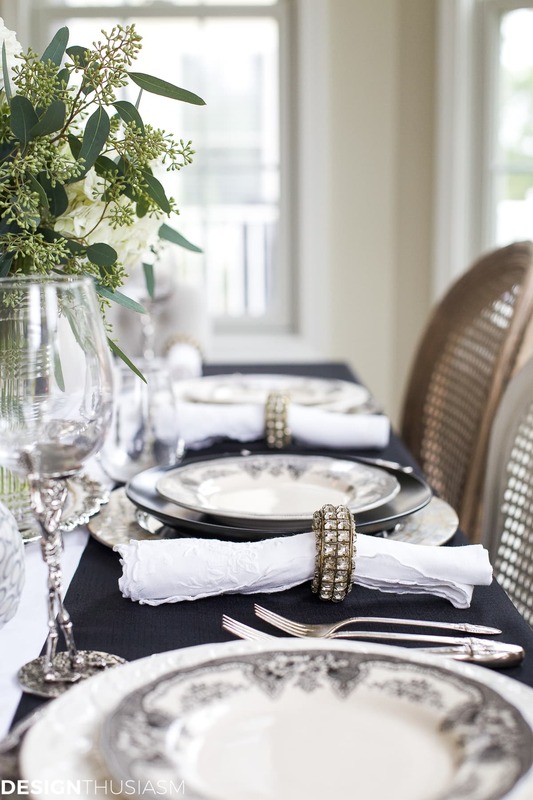 What a fun and elegant tablescapes! Of course I visited Plush Pumpkins! I want ALL of them! Thanks for the inspiration! I’m still working on last year’s top 10 with the bejeweled skull! Now, I might just finish it! Thank you, Debbie!! I’m glad people can appreciate my perspective… 😉 Glad you visited! Tres chic! A very fun way to celebrate. 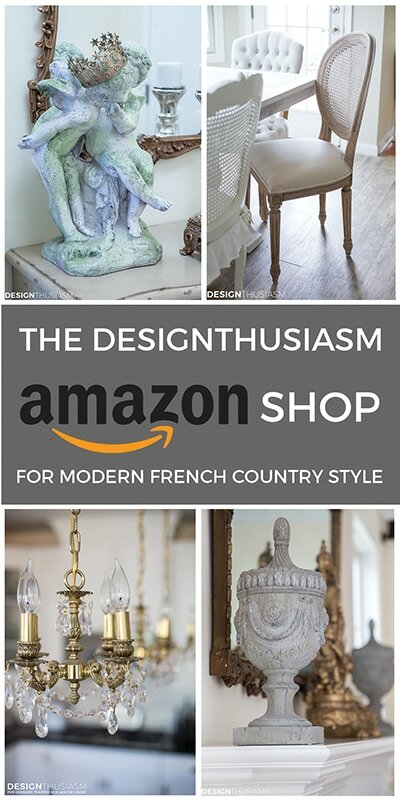 Your plush pumpkins (which I visited) works so well on your table. I feel exactly the same way when I visit your blog, Lidy!! Thanks so much and thanks for organizing a great tour! 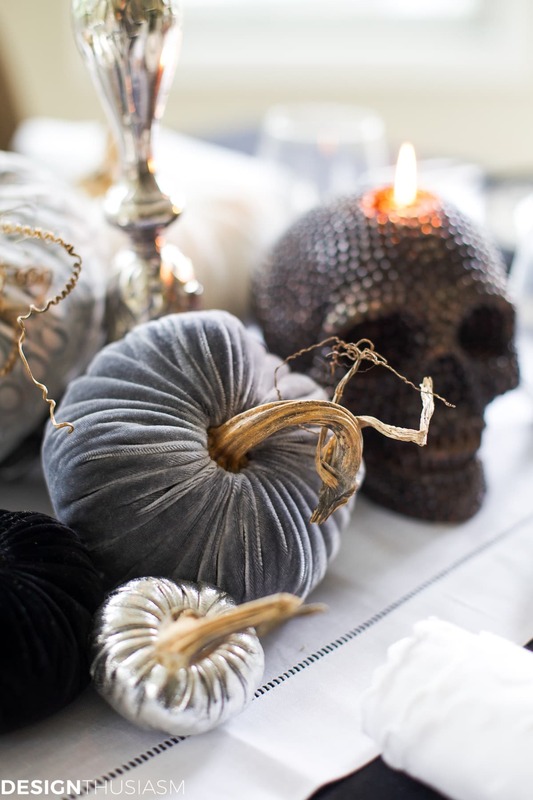 new to your blog, not a fan of halloween or skulls, but the rest of your tablescape was inspiring I really love the plush pumpkins and went on their website one pinned pumpkins for contest!!! Lory, you are one of my favorite blogs. Always elegant including Halloween. Shanah tovah to you and your family. Thanks so much, Myrna! You just reminded me I need to edit the photos from my Rosh Hashanah table! Shanah Tovah to you too!! I visited Plush Pumpkin and love the velvet pumpkins! Thank you for entering me into the giveaway. You are so very welcome, Cynthia!! Thanks for visiting! I pinned the beautiful pumpkins. Thank you! 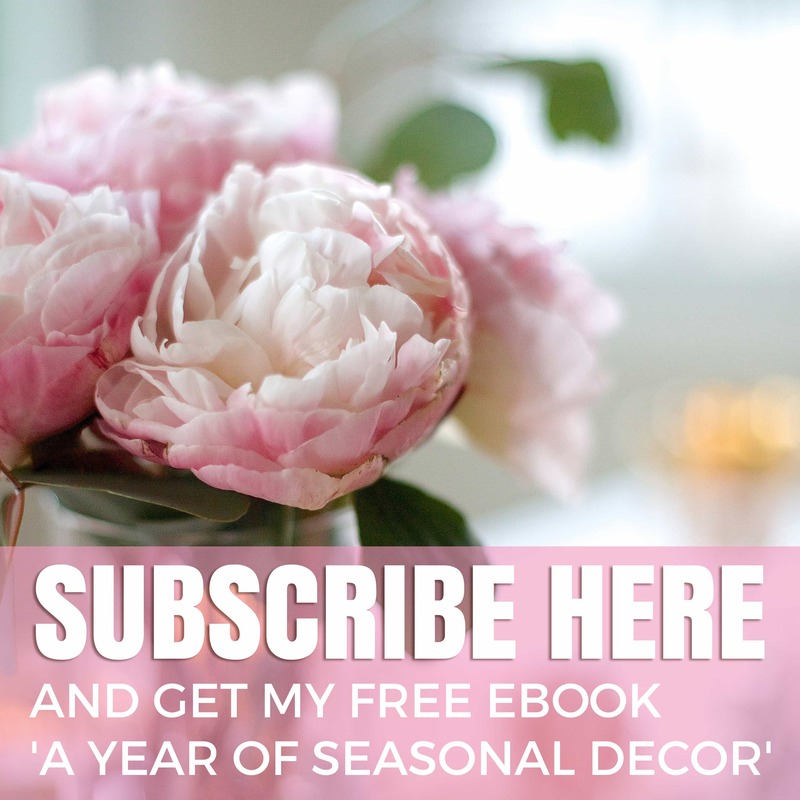 I am new to your site and love your elegant decorating style. I pinned the Plush Pumpkins. Love these gorgeous pumpkins and you sure know how to incorporate them into your very elegant adult table setting for Halloween! I have pinned the picture and am praying that I will be the winner so that I can create an exquisite display with them also. I love your decorating style & always look forward to all your posts. Oh, thank you so much, Shelley, for the kind words! I’ve given all your names to the person running the drawing, so good luck!! It’s giving a perfect Halloween feel. Amazing decor. Thanks for sharing this post. 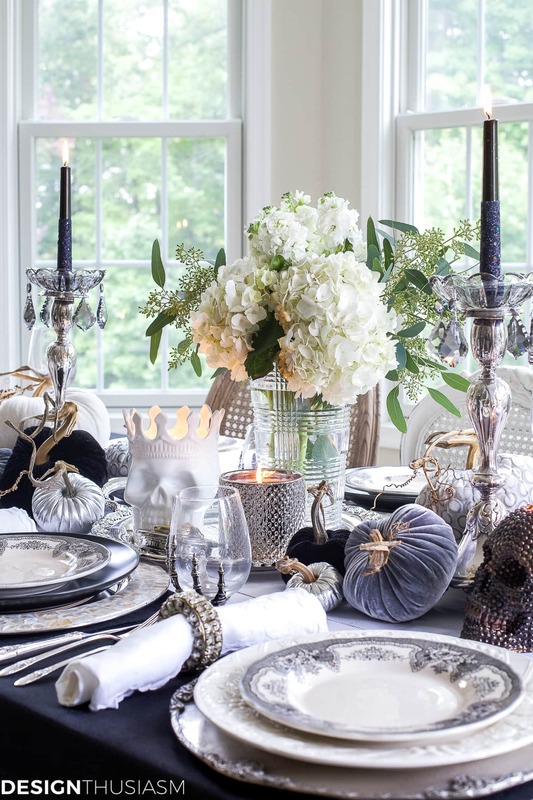 Lory, I love your elegant Halloween setting! I did a very similar one last year, using the same colors as yours because I wanted to get away from the orange and black for an all adult party. Wasn’t sure how it would play out but everyone just loved it. Wish I would have found the mother of pearl chargers…they really pop the settings. 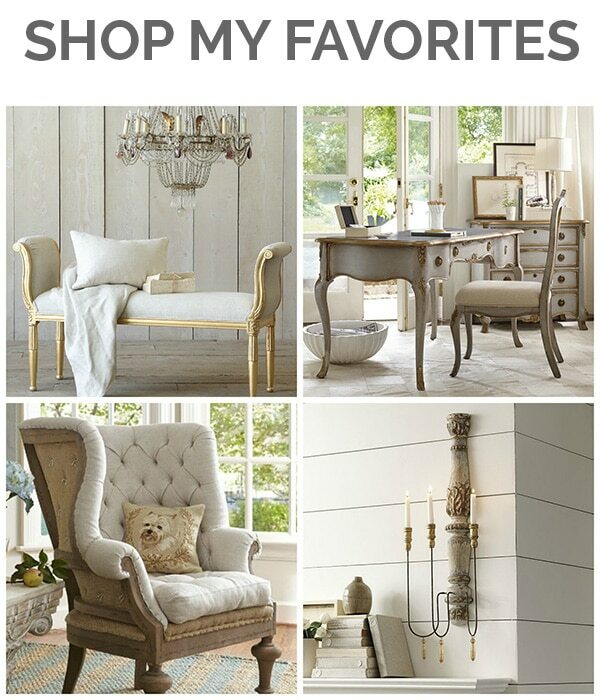 I still love the fall colors but this neutral palette just looks so sophisticated for the grown-ups. I love all your amazing tablescapes, Lory. Hugs! I agree Bobbi! I’m sure I will be doing something with true fall colors very soon, but even then I try to soften it… 🙂 Did you take a photo of your table. Would love to see it. 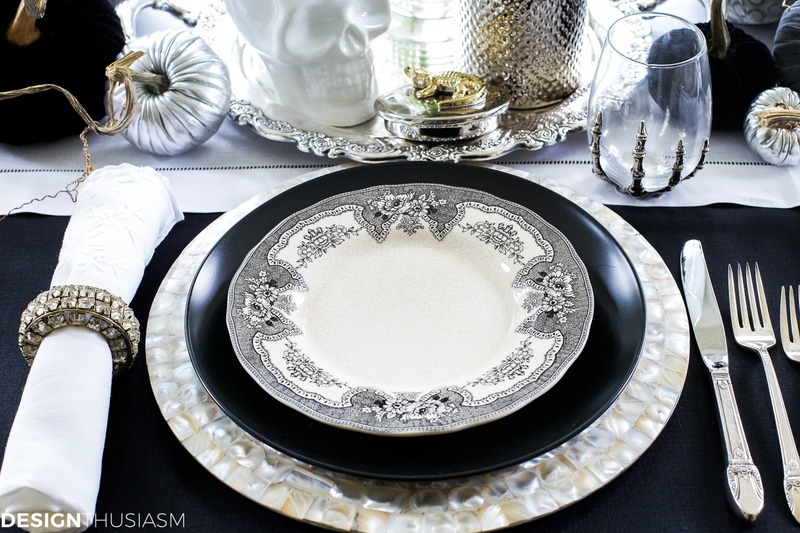 The black and white transferware dishes are so pretty. 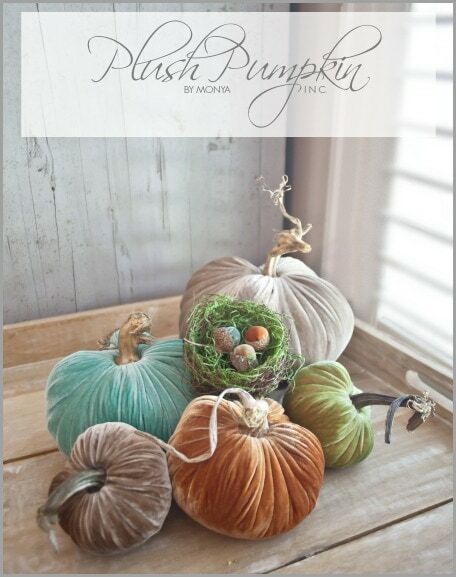 I love all the wonderful creations at Plush Pumpkins and would be happy to have some of them in my home. Cute I mean spooky table! Haha, that’s funny! I actually preferred the flutes that they had with just the bony hand – not the entire skeleton – but they were out of those. I love your elegant style. Your tablescape is gorgeous and unique. Thanks for sharing. ?I pinned the Plush Pumpkins. I haven’t done anything Halloween oriented in years, but if I did you would totally be my go-to for inspiration! Wow. Love those goblets. What a beautiful table. It puts me in the fall spirit. Thanks for sharing. Thank you so much for your lovely comment, Rhonda!! Visited. 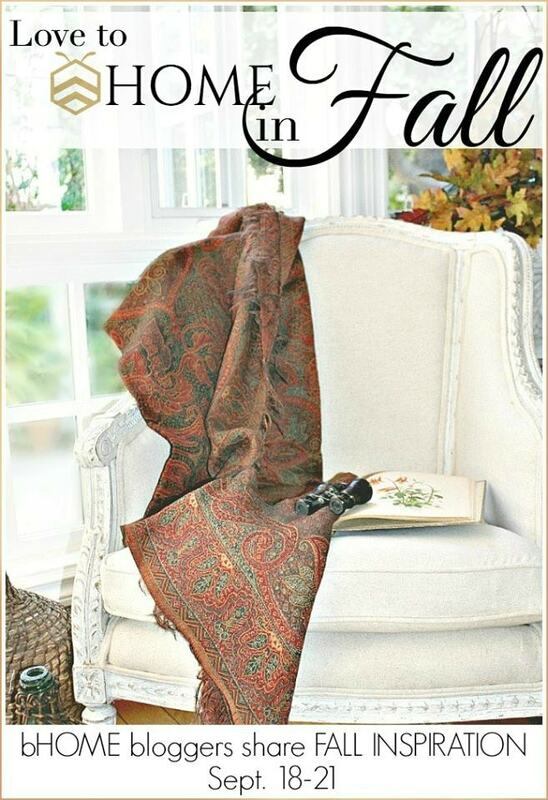 Love the Autumn Collection. Thanks for the opportunity to win! Elegant spookiness. Just the way I like it! Lory, if I had to describe your blog it would be “quiet elegance” You never fail to impress. I pinned the pumpkins too. The Spicy Citrus Trio would nest perfectly in my antique English scales, which are painted a dark, old green with brass measuring pans! Loved your sophisticated table with the black and white theme.